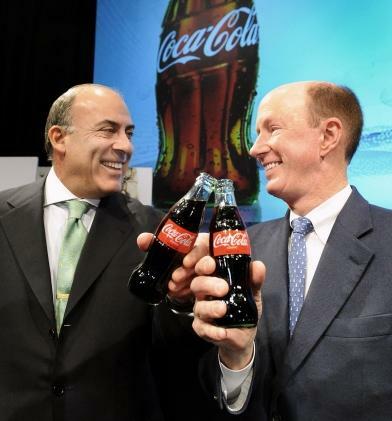 Coca-Cola Chairman Muhtar Kent, left, toasts the deal with Coca-Cola Enterprises Chairman John Brock. As expected, Coca-Cola Enterprises Inc. shareholders on Friday gave their stamp of approval on the pending $13 billion sale of its North American operations to The Coca-Cola Co. The transaction already has all the required government approvals, so it should close in the coming days, Atlanta-based Coca-Cola Enterprises said. Coca-Cola Enterprises has information-technology and distribution operations in Louisville. Following the merger, the operations will be folded into The Coca-Cola Co.
Once the deal is complete, Coca-Cola Enterprises (NYSE: CCE) will become an entirely western European business and will go from being the world’s largest Coca-Cola bottler to becoming the world’s third-largest independent bottler of Coca-Cola products. It also will go from 70,000 employees to 13,000 employees. CCE’s workforce in Atlanta will go from 3,500 employees to about 100. The other 3,400 employees will join Coca-Cola (NYSE: KO). About 10 CCE employees will be transferred to CCE’s European headquarters near London.